Have you ever thought about visiting Breckenridge in October, off season? You totally should. There are so many reasons to visit Breck, but October is just a special time. Not only is Breckenridge, Colorado a ski town, but it’s perfect for families, couples, and yes, even girlfriend getaways. 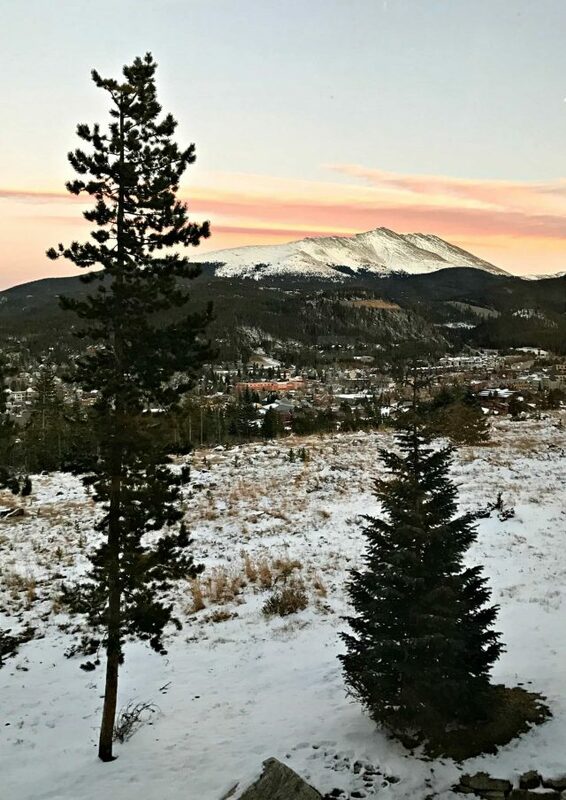 Here 6 tips for the perfect girls getaway when your’e visiting Breckenridge in October. The best way to get to Breckenridge is to fly into Denver International Airport. Break is about a 2 hour drive from the airport. You have a few different ways you can get there: rent a car, hire a car, or take a shuttle. Renting a car is the best option if you want to have transportation in Breck. As our driver told us, Uber and Lyft are practically nonexistent so if you want to get around, you’ll need a car. However, if you’re going on a girls weekend (read: wine weekend) and don’t need a car, then you’re left with hiring one or taking a shuttle. Shuttles are scheduled a few times per day (assigned according to your flight arrival time) and are about $65 on average per person. If you have a few people arriving at the same time, I recommend hiring a car. Summit Express is who I hired to take us up the mountain, and while it’s expensive to hire an SUV or personal van, you’re not waiting on anyone else. Plus, it gets your girlfriend weekend off on the right foot! Are there more than 4-5 of you girls getting together? Don’t try and organize hotel rooms; renting a house is so much better and easier. You can cook together, drink wine by the fire, and not worry about whose room you’re hanging out in. Pinnacle Lodgings is a great resource for finding a good house (or condo). When we went to Breck for the weekend there were 10 of us, so we rented The Overlook. It was a GORGEOUS home with enough bedrooms and bathrooms for everyone, plus a gourmet kitchen. Seriously, I could get used to living like that. 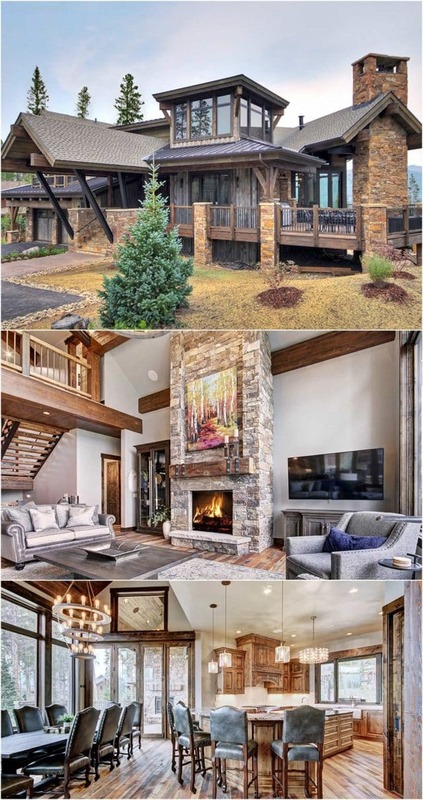 From the state of the art kitchen to the bathrooms for each bedroom and all the amenities and things everyone would need (like hair dryers), this house would be perfect for a girls weekend or a family ski weekend. One of the best things about visiting Breckenridge in October is that it’s off season, which means housing is cheaper. You’re going to be able to rent a home or condo like this one for much less than during peak ski or summer season. The Overlook is close to skiing for winter and hiking for summer, and it’s big enough that you and your girlfriends can relax all weekend and never leave if you don’t want to. The weather in October in Breckenridge is unpredictable. The average highs are in the 50s, but it can range from high 60s to low 30s. Make sure to pack layers because you never know, plus everything indoors is heated well. I think snow in October is somewhat rare, but when we were there it snowed. I was so excited; I’d never been in snow while it was snowing and it as magical. That’s me, being a dork. See my full reaction here. Basically, the weather in October is perfect if you’re not there for hiking or skiing. It’s the perfect sweater and hot chocolate (with schnapps) weather. Plan for a full day in town. There are so many shops and restaurants and you’ll want to see them all. We only spent a few hours shopping and we were so busy I forgot to take any photos! 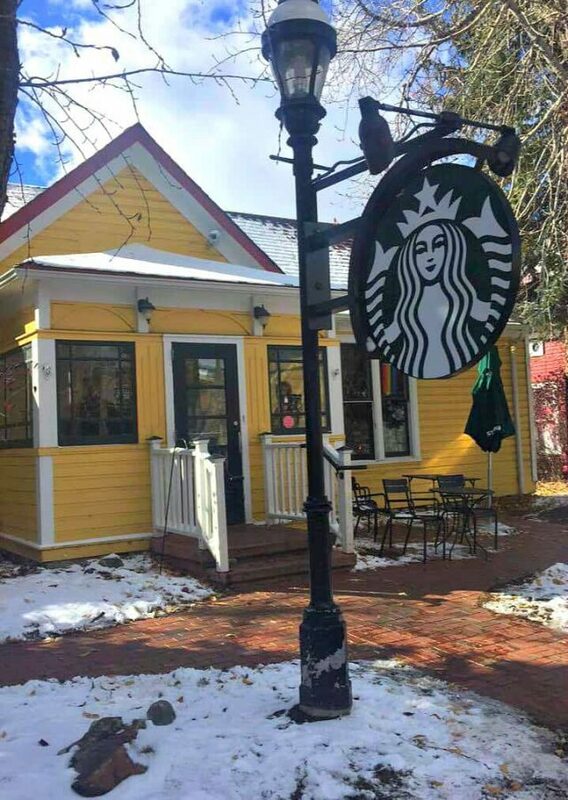 My friend Holly took this one of Starbucks, and it gives you an idea of how cute town is. There are stores for everything, from souvenirs to clothing, home to kids toys and everything in between. There are restaurants and cafes everywhere too. Plan a day to shop shop shop. 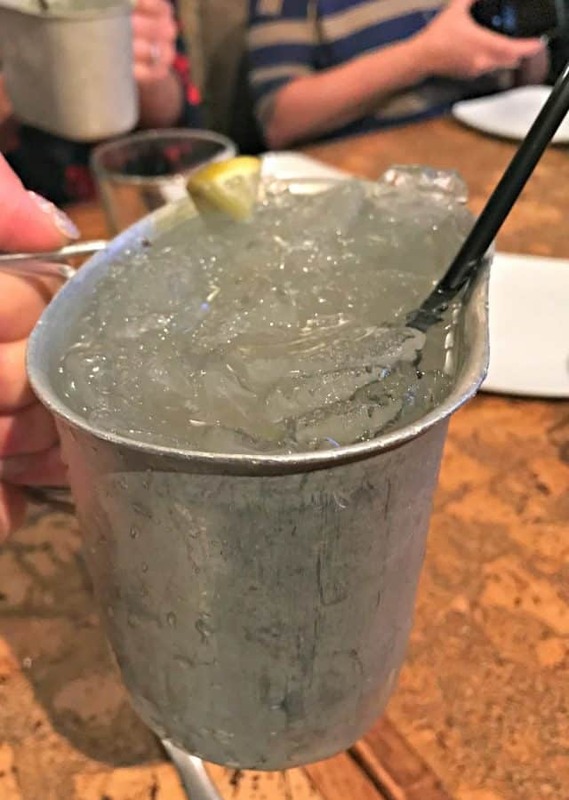 I loved Marigold’s Farmhouse Funk & Junk (I bought jewelry, clothes, and Christmas ornaments made out of old spoons and hand painted), Fuzziwigs for kids souvenirs, and the Colorado souvenir store next to Starbucks for t-shirts and such. Breckenridge is at approximately 9,600 feet above sea level. Even if you think you’re used to altitude, this is some serious stuff. I never have issues in Tahoe (about 5000 ft) but every time I moved in Breck I thought I was having a heart attack. Just talking would make me breathless. It really is a blow to the self-esteem, making you think you are out of shape, but it’s just the altitude. Luckily, the town knows this. 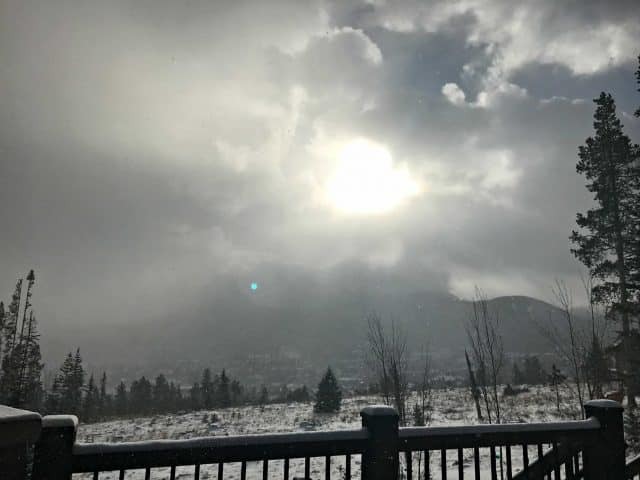 If you’re struggling with altitude sickness or oxygenation (or have a hangover) you can get oxygen and/or IV medicine at Vida-Flo on Main Street. A gal in our party was really sick and they gave her nausea medication and fluids, as well as oxygen and it really helped. I can’t forget about the food! Because we rented a house, we didn’t eat out much. But we did have a few good meals in and out of the house. For a girls trip where you rent a house, it’s so fun to cook together. We were all food bloggers, so this was easy. At the end of the weekend the fridge looked like we didn’t eat anything! Most memorable home cooked meal: Creamy Tomato Basil Soup by my friend Lynne. I don’t even like tomato soup and it was pure heaven. 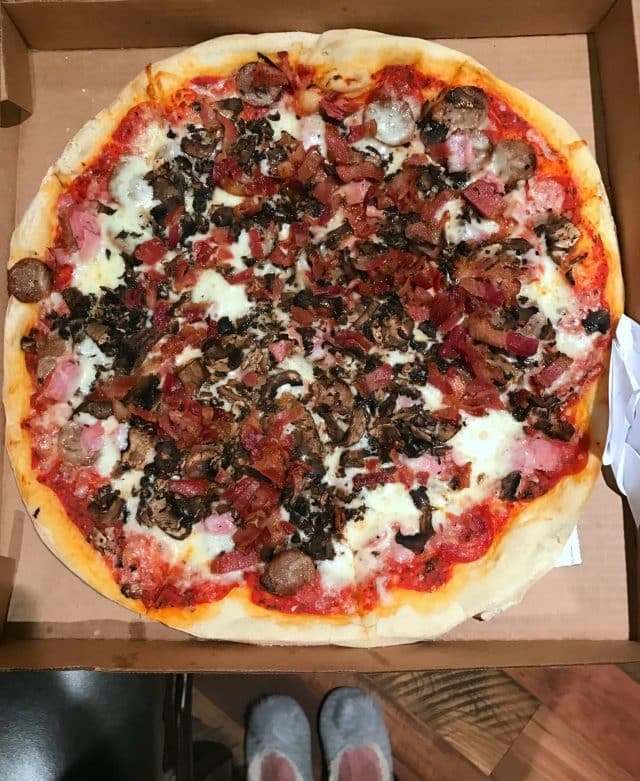 We had pizza delivered one night from Giampietro Pizza. It was SO GOOD. I highly recommend the cannoli for dessert. If you want a fun dinner at home Real Housewives style, get a chef to come in and cook for you. We did that the last night and he prepared a gourmet meal from start to finish. Chef Christian made a delicious meal for us and I ate every last bit. If you’re thinking of visiting Breck, DO IT. I highly recommend visiting in October when the weather is mild, the town is less crowded, and the lodging is cheaper. 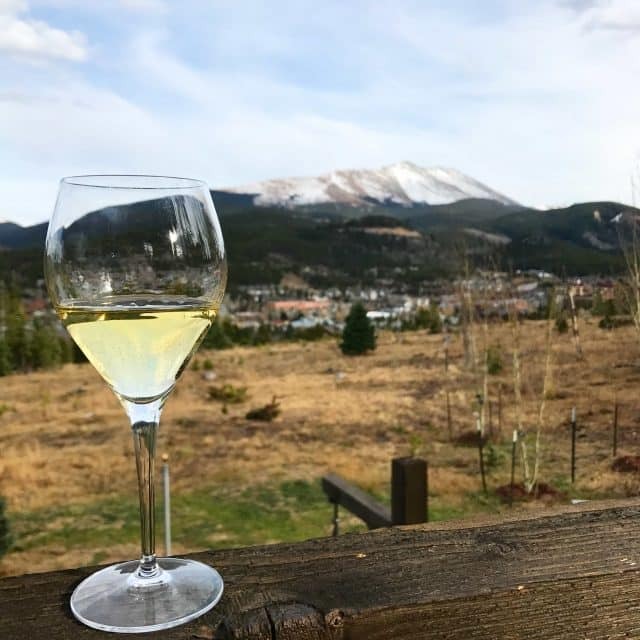 Have you been to Breckenridge? Tell me what you loved in the comments! Thank you to GoBreck, Pinnacle Lodging, and Mediavine for sponsoring the retreat. All opinions are 100% my own. As a Colorado native, Breckenridge is one of our FAVORITE places! Did you get to go to Crepes a la Carte or Mi Casa? Love your blog and all your gooey bar recipes! What a great post with so many useful tips! I have never been there but the whole altitude sickness is something to think about! Wow! I LOVE tomato soup and now I want to try Lynne’s recipe! 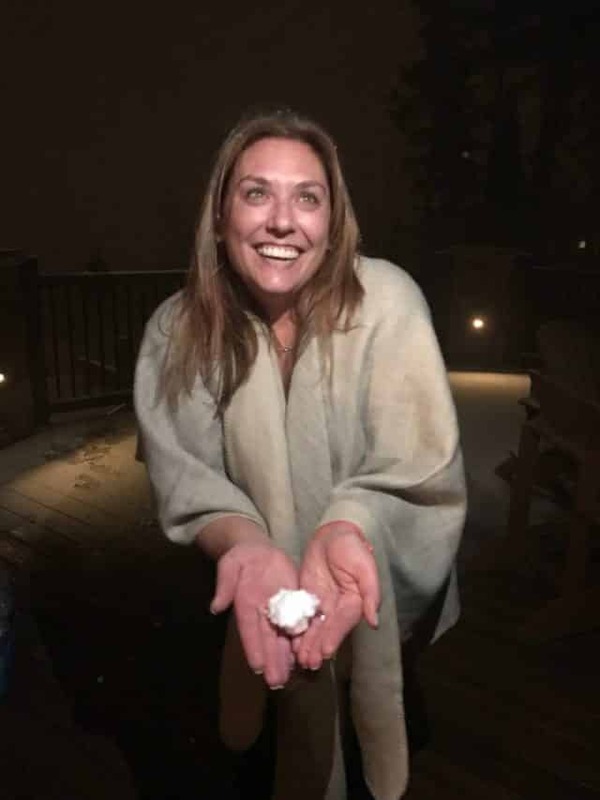 As I am a summer (and October) resident of Frisco, the next town from Breck, I enjoyed your blog. The Canteen has amazing Mac ‘n Cheese and DiPitroo’s Pizza is awesome. So glad you enjoyed an October Breck. And your cautionary tale about altitude sickness should be taken seriously! My daughter lives out there in Frisco, which is one town over. When I visit her I always go to Breck. It’s a cute town. Sometimes we ride the gondola up the mountain. I’m glad you enjoyed yourselves. & yes that altitude is something else. Had a wonderful 10 days in Breckinridge several years ago. One fun thing we did was to attend a chili cook off! Lots of trips to surrounding areas- Aspen and Vail were so much fun- as was Frisco. Even ran into a fantastic sports car rally in one very small town- saw our very first Bugatti automobile. Believe me that was a highlight of my husband’s life! We were there in September. During the drive from Denver, we experienced every type of weather imaginable- rain, sleet, hail, snow, fog and sunshine! We have quickly changing weather in North Carolina but nothing like this! Thanks for reminding me of that great vacation. I am so glad you came to Colorado and enjoyed it! I could not have asked for a better weekend, it was so much fun!